SUBHEAD: Hawaii may seek higher state taxes to cover Honolulu Authority Rapid Transit cost overrun. Image above: HART rail guideway car photo-op over Farrington Highway at Leokane Street near Waipahu Sugar Mill. From Civil Beat article below. Photo by Cory Lum. I hope the neighbor island folks reading this message are ready to fight the Legislature to help stop the biggest fraud ever perpetrated upon our people since statehood, the Honolulu rail boondoggle. Why should any of you help pay for this fraud? The state uses the argument that it helps other counties with [reasonable and legal] public projects so why not require other counties to help with this illegal and fraudulent one to continue the fleecing of our people and continue to cause irreparable financial harm to the people of Hawaii for another three or more generations, all to protect the profits of the wealthy, power elite? When will the people wake the hell up and rebel against our crooked and corrupt city and state government, the most corrupt in the USA, and stop this abuse of power? Public testimony will be accepted however, please avoid repetitive and duplicative testimony. SUBHEAD: Lawmakers consider making Outer Islands help pay for Oahu's troubled rail project. With a special session set for the end of August, the Hawaii Legislature will lay out several funding options for the public at a briefing next week. Hawaii lawmakers are weighing five options to provide funding to complete Honolulu’s over-budget rail line from Kapolei to Ala Moana, including a statewide increase in the general excise and hotel taxes, according to a state Senate presentation obtained by Civil Beat. The Legislature plans to hold a special session later this month to try again to reach a deal on how to pay for the 20-mile, 21-station project, which is now estimated to cost $10 billion. Key House and Senate committees have scheduled a joint public information briefing Monday morning at the Capitol. The new options to fund the project, along with the choices under consideration before the Legislature adjourned in May, are expected to play a central role in the negotiations. The draft 52-page presentation, provided by a state senator Monday, lays the groundwork for a case to have Kauai, Maui and Hawaii counties help fund Honolulu’s beleaguered project. It notes that Oahu subsidizes harbors, airports and highways on the neighbor islands. The presentation includes options to extend the 0.5 percent general excise tax surcharge for Oahu; increase the GET surcharge for Oahu; extend the GET surcharge for Oahu and increase the hotel tax for Oahu; or establish a statewide GET surcharge and hotel tax increase. The Federal Transit Administration is kicking in $1.55 billion for the project. 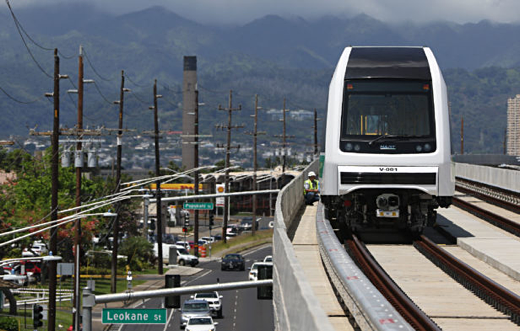 It could withhold some of those funds, particularly if the rail line has to stop short of its plan to go from Kapolei to Ala Moana Center. The project was expected to cost $5.2 billion just a few years ago. House Speaker Scott Saiki has said the city’s latest figures project a nearly $1.4 billion shortfall from now to 2024. The two chambers ended the session far apart. The Senate left with a bill to extend Oahu’s 0.5 percent general excise tax surcharge for 10 years, until 2037, to help complete the rail project. That’s the option Honolulu Mayor Kirk Caldwell and the tourism industry supported. The House pushed a bill that would have allowed the GET surcharge to be levied for just one additional year, to 2028, while increasing the state’s 9.25 percent transient accommodations tax for 10 years. “In spite of our impasse during the 2017 legislative session, the Legislature understands the importance in crafting a legislative solution that will provide the City and County of Honolulu a dedicated revenue stream,” said Senate President Ron Kouchi in a press release announcing the public briefing. The briefing starts at 10 a.m., Monday, in the Capitol auditorium. The special session is set to run from Aug. 28 to Sept. 1. See the draft presentation, which a state senator said was created by the Senate Ways and Means Committee at link below. SUBHEAD: UH Law Professor says the cost of building the Honolulu Rail is getting out of hand. Video above: Retired UH Law Professor Randy Roth sums up rail project in 3 minute video. From (https://youtu.be/ZL9pIrxaA3Q). He also described the project as deliberate misrepresentation, deliberate fraud on this 30 minute ThinkTech Hawaii with Kelii Akina, President of Grassroot Institute. From (https://drive.google.com/file/d/0Bw_NDLg6EbbmYlNOSy13a0NKNmM/view?usp=sharing). Whether one is Pro-Rail or Anti-Rail, there’s something virtually everyone in the state agrees about – the cost of building the Honolulu Rail is getting out of hand. Not only that, serious questions have been raised about how well the funds already invested in this project have been spent. Law professor Randy Roth, who has a long history advocating for the public good, appears on E Hana Kakou with Dr. Akina to discuss why it is time to hold our government leaders responsible for the progress of the Rail. Our vision is to be a leader in shaping a more vital and thriving Hawaii as the foundation for future generations. Our mission is to be the leading digital media platform raising pubic awareness and promoting civic engagement in Hawaii. SUBHEAD: Watch short video and sign the petition here to require a forensic audit of the rail. Video above: Group seeks to audit the Honolulu rail project with "Where is our Money Going?" From (https://youtu.be/X8Fa2qr2djg). Longtime journalist Mark Coleman talked recently with ThinkTech Hawaii host Tim Apicella about his recent Grassroot Institute of Hawaii article titled “Honolulu rail clearly a fiasco,”and suggested that now would be a ideal time to subject the over-budget, behind-schedule project to an independent forensic audit. In particular, Coleman suggested that the state legislators use their upcoming special session to order such an audit, which would allow them to avoid extending or raising any state taxes until they have better information about why the city’s rail project has veered so far off track — while yet so much of it remains tobe built. The timing is apt, he told Apicella, because the City Council just approved selling bonds to fund construction of the rail through to next year, thus taking pressure off the Legislature to consider anything before it starts its regular session in January 2018. Coleman said transportation experts warned city officials years before the rail project was even started that it would be a “gigantic white elephant,” and by now it’s clear that just about everything that could have gone wrong with the project has — though nobody has a definite explanation as to why. Has HART committed federal crimes? SUBHEAD: Is falsification of federal documents, lying to officials to get $1.55B HART a crime? Systemic fraud, waste, and abuse of power, violations of public procurement codes, violations of the Hawaii State Constitution's Public Trust Doctrine, violations of basic ethical and moral principles, perjury, deliberate falsification of Federal documents / lying to Federal officials, deliberate misrepresentation of facts, deliberate fraud, bribery, racketeering, malfeasance, graft, conspiracy to defraud, and criminal offenses directly related to obtaining $1.55B in federal funds for the Honolulu rail project. Those advocating for a forensic audit & investigations include former Hawaii Gov. Ben Cayetano, retired UH Law Professor Randy Roth, UH Civil Engineering Professor, Panos Prevedouros, President of Grassroot Institute and OHA Trustee, Dr. Keli’i Akina, former Army War College faculty instructor, retired Col Al Frenzel, retired businessmen, 2 attorneys, an accountant, and concerned citizens. Dr. Keli’i Akina submitted testimony to the House Committee on Transportation & Infrastructure, Subcommittee on Railroads regarding these issues. All major newspapers and TV networks around the country have been notified about the dire situation in Hawaii. It is argued that the City is jeopardizing its credit rating and solvency over this project and someone has to stop the bleeding, stop the irreparable hard this rail project is causing our people today, and for the next 3 generations, and folks in Washington seem to be turning a blind eye to this matter. In lieu of reviewing rail-related documents online, I request a formal meeting with a Honolulu FBI agent to discuss this urgent matter, a meeting to include those advocating for these investigations. Others have written to FTA, OIG, GAO, and Congress, and spoke to some officials. One high ranking official stated to one individual that perjury to obtain federal funds for rail appears to be involved. The Honolulu rail is likely a massive government cover up similar to Watergate, but called HARTgate. Please help us. This dire situation is reaching critical mass. Messages sent to Washington and FBI. The city deliberately falsified federal documents, lied to federal officials, and lied to the public. I encourage everyone to submit a request to the FBI to conduct an investigation. Please give these messages widest possible distribution.